Seems a good price on this router, next cheapest available from a well-known seller is £156 from eBuyer. Cheapest that it has ever been on Amazon, too (according to camelcamelcamel). By no means an expert on routers, but very well reviewed, and currently in the market for a router myself. Does this have better WiFi range than BT whole WiFi deal posted recently? Whole Home WiFi would probably be best for a small home, but the deals recently are two-disks - I would really need a minimum of three included to erase the need for powerline adapters. As it is, I'll need them either way so one device is preferable. Cheers for this. It just doesn't get to the back of the house upstairs. I already have an Ethernet cable going upstairs to the pc. Thinking of putting that cable to a new router and another cable between the router and pc. That might work! I had a netgear D7000 then bought this. Wifi range of netgear was slightly better than this. Know it doesn't answer your question but just for info. Cheers for this. It just doesn't get to the back of the house upstairs. I …Cheers for this. It just doesn't get to the back of the house upstairs. I already have an Ethernet cable going upstairs to the pc. Thinking of putting that cable to a new router and another cable between the router and pc. That might work! I had a better D7000 then bought this. Wifi range of nether was slightly …I had a better D7000 then bought this. Wifi range of nether was slightly better than this. Know it doesn't answer your question but just for info. Surely these are better than ISP supplied routers? These have more features but as a home user I'm yet to see any major improvement . 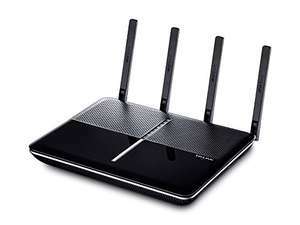 Im returning my 3rd tp-link router due to 2.4ghz drop outs and going to give the bt whole home system a try instead. Im returning my 3rd tp-link router due to 2.4ghz drop outs and going to …Im returning my 3rd tp-link router due to 2.4ghz drop outs and going to give the bt whole home system a try instead. TP Link stuff either seems to work well for people or not at all when you read the reviews. I've had a few modem routers and all worked well but others have problems it seems. I had a netgear D7000 then bought this. Wifi range of netgear was slightly …I had a netgear D7000 then bought this. Wifi range of netgear was slightly better than this. Know it doesn't answer your question but just for info. Out of interest, why did you return the D7000? TP Link stuff either seems to work well for people or not at all when you …TP Link stuff either seems to work well for people or not at all when you read the reviews. I've had a few modem routers and all worked well but others have problems it seems. Mine did that too, found out what it was. Turned out to be interference close by for USB 3.0 hard drives. These are great for the money. TP Links support is much better than the likes of Asus and others in my experience. Is that even possible? Connecting a 3rd party router to the main connection. Edit: Virgin will charge me £79 to move the router to a different location. Not happening. Is that even possible? Connecting a 3rd party router to the main …Is that even possible? 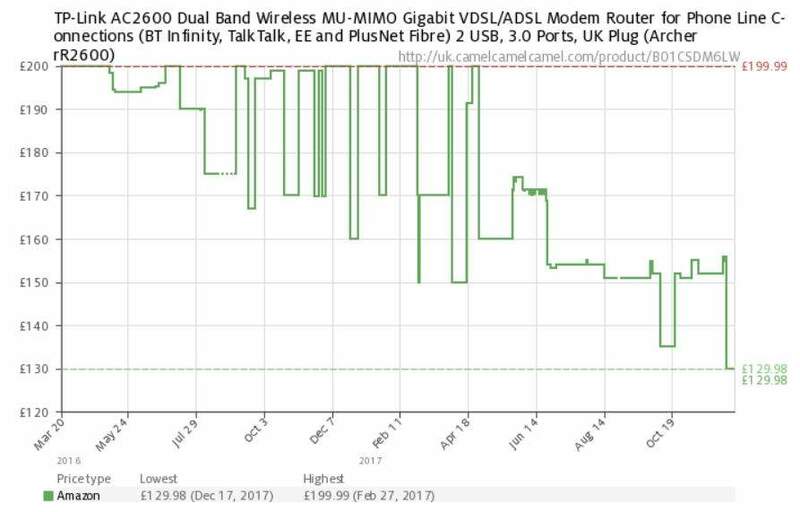 Connecting a 3rd party router to the main connection.Edit: Virgin will charge me £79 to move the router to a different location. Not happening. That is to install a new port, I assume. To move the router upstairs. I'm guessing that might be another connection. I've found this cable, might for it instead. I've got one of these and all was good until we upgraded my wife's phone to an iPhone SE for the WiFi calling. It works flawlessly on the Vodafone bundled router but refuses to work on the VR2600. Price back up to £155.94. Amazon do know how to pi** folks off at times.